My friend came to visit and wanted to go to Coney Island. For some reason she wanted to come to the city and then go to Coney Island. It’s not like she hasn’t ever been there, in fact one year ago to the day we went to see Rob Thomas at the Ford Amphitheatre in Coney Island. So we got on the subway and headed to Coney Island and the beach. 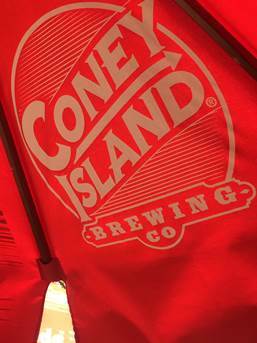 It wasn’t a problem for me since I am doing a “Summer Brewery Tour” and there is a brewery in Coney Island, coincidentally named, Coney Island Brewing Co. The only problem I could see was convincing my friend to go there since she is not a big beer drinker. So we get to Coney Island and walk along the beach. Eventually she wants food. We find this little place to get food, I think it was the same place we got food a year ago before the concert. She asks if I want to get a beer – so here goes. She thinks about this for a second and replies that she thinks that is a good idea. We ordered grilled cheese sandwiches and fries. They were O.K., nothing great and when finished we headed to the brewery. When we got there I got a little worried, it didn’t look like there was anything she would like, but the last item Lime Twist, she said sounded good. A woman at the bar turned around and said, “Oh it is, it tasted like cream soda.” She got that, I got my Tart Cherry and we headed outside. It wasn’t our choice to sit outside, it was rather warm and inside was cool with the AC, however, the tap room at Coney Island is very small and all the seats were taken. Even though we were outside, there was a bit of a breeze and all the tables have these big umbrellas so it wasn’t unbearable. The best thing for me was being able to spend the day with my best friend and check another brewery off the list. 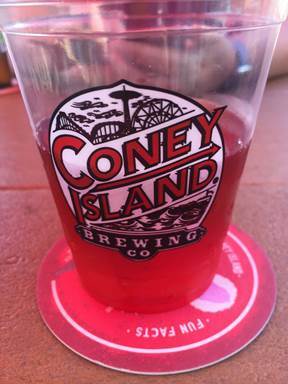 Posted by Belleza on September 6, 2017 in New York and tagged Brooklyn, Coney Island, Craft Beer, Food, Food & drink, NYC Craft Beer, Summerbeertour2017.